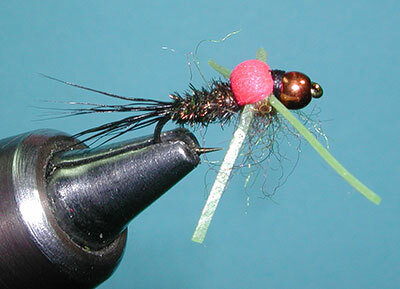 Guy Jeans of Kern River Troutfitter's came up with this excellent variation on the Hare's Ear Nymph with his Kern Emerger in 2004. It has many of the same components as a Hare's Ear Nymph but utilizes different materials which tend to be more flashy and give additional contrast. Guy uses a Peacock Herl body with a Black Dyed Deer Hair tail. The thorax consists of the Synthetic Living Fiber Dubbing that Poul Jorgensen introduced in a Fall Green Olive color. This dubbing has a multi-color blend and provides both translucency and sparkle. 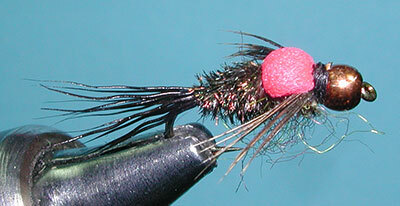 He produced it for Steelhead and Salmon but it is an excellent trout fly material as well. Guy will pick out the fibers to suggest legs or appendages. The foam wingcase helps lift the fly off the bottom and also gives the fly a color contrast that evokes attraction for a strike. For addtional action, Guy will add rubberlegs. 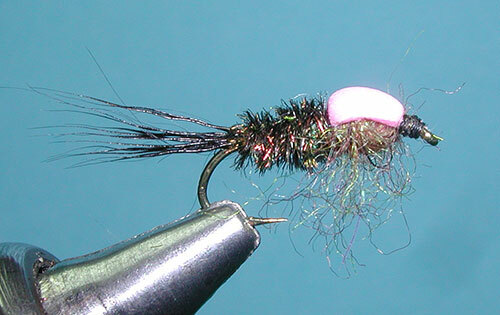 Beadhead patterns use the same thorax material but will not be picked out. 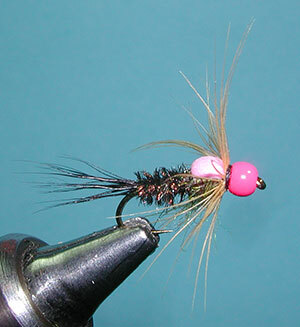 A soft hackle of partridge or Brown Hen is used to accomplish the leggy look. The Kern Emerger has been the "goto" fly at the Kern River since he introduced it and has been getting wide acceptance throughout the Sierras.